Latest out of Washington, D.C. Stability should be the immediate goal, said former Health and Human Services secretaries Kathleen Sebelius, Mike Leavitt and Tommy Thompson. At minimum: Dispel the political and legal uncertainty — fueled by presidential tweets — around billions in subsidies for consumers' insurance copays and deductibles. The three former officials shared their views with The Associated Press. Beyond the urgent need to calm markets by providing clarity on subsidies, Democrat Sebelius and Republicans Leavitt and Thompson differ on the direction Mr. Trump and Congress should take. They agree that Republicans still have an opportunity to put their stamp on the Affordable Care Act, even if the drive to "repeal and replace" former President Barack Obama's legacy program appears to have hit a dead end. "They can make changes that signal a new ideological direction without generating a logistical and political mess," said Leavitt, who led HHS during former President George W. Bush's second term. "They won the right to make changes. However, they should do it in a skillful way." Leavitt shepherded the Medicare prescription drug benefit through its rocky rollout in 2006. "Stabilizing the current situation can only — I think — be to their benefit," Sebelius said of the Trump administration. "In an environment in which (insurance) companies are enrolling customers, they've got a lot of time to actually go back to the drawing board and figure this out. The worst of all worlds for them would be to have the current situation unravel because of decisions by this administration." Sebelius helped steer Obama's law through Congress and later oversaw the troubled launch of HealthCare.gov, when the computer system locked up on the first day of sign-up season, frustrating millions of consumers and embarrassing the White House. 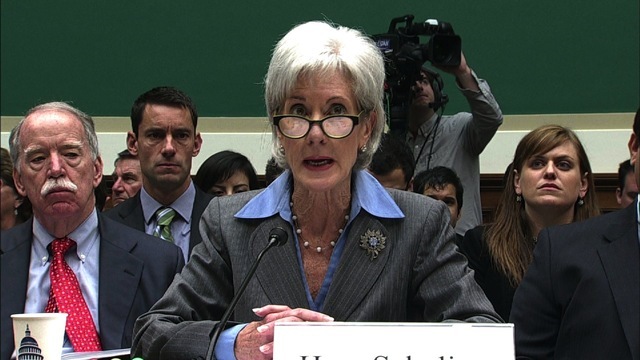 She took the heat, but Sebelius stayed on task and ultimately helped deliver a successful open enrollment. "It would be a mistake to further destabilize the (insurance) market," said Thompson, who served during Bush's first term and led HHS preparations to meet the bioterrorism threat after the deadly anthrax mailings that followed closely the Sept. 11 attacks. Thompson urged a health care summit between Mr. Trump and congressional leaders of both parties, followed by a period of intensive legislative work under a deadline to reach a truce in the political battle over health care. Mr. Trump and top lieutenants like HHS Secretary Tom Price have sent mixed signals. Leading congressional Republicans want to try to move limited legislation after lawmakers return next month, worried they'll suffer consequences in next year's midterm elections. At the very least such legislation would provide clear legal authority for the ACA's cost-sharing subsidies, which reduce copays and deductibles for people with modest incomes. Stopping the payments would lead to a spike in premiums, more insurers leaving the markets and increased federal deficits, the Congressional Budget Office warned last week. The markets already saw steep premium increases this year, and more insurers have since bailed out, citing financial losses. The administration has continued to make monthly subsidy payments to insurers, as recently as last week. But Mr. Trump on Twitter and in interviews has repeatedly threatened to pull the plug. Sebelius has been sharply critical of the Trump administration's stewardship of the ACA. Two of the former health secretaries — Leavitt and Sebelius — said states are now likely to assume a bigger role in shaping the future of Obama's law. A waiver pathway for states was built into the law, and Republicans want to make it less restrictive. That's a key focus for Senate Health, Education, Labor and Pensions Committee Chairman Lamar Alexander, R-Tenn., as he plans bipartisan hearings this fall with Democratic counterpart Patty Murray of Washington. Leavitt sees waivers as a way to provide states more flexibility to tailor their insurance market rules to local needs and preferences. Sebelius says that should not be done in a way that undermines federal consumer protections like standard benefits. She'd like to see states use waivers to help offset the cost of care for the sickest patients. Thompson says he believes a bigger deal, at the federal level, is still possible if Mr. Trump plays his cards right with Congress. Former HHS Secretary Sylvia Burwell, who served during most of Obama's second term, declined interview requests.